I’ve definitely made a lot of cakes over the years – sponge cakes, butter cakes, tea cakes, flourless cakes, tortes. Cakes for all occasions, from the simple and sublime to elaborate celebration cakes. There are lots of books dedicated to cake baking and so many great recipes to choose from, but once in awhile you find one that really does take the cake. For me, this semolina cake really stands out above most. A little bit of semolina is combined with the flour to change things up ever so slightly. There's also some lemon juice and zest to brighten the flavor. And much like Emily Luchetti’s Lemon Curd Cake, this one starts with a pastry cream into which a small amount of butter and dry ingredients are added. Then a Swiss meringue is folded in to lighten the whole mixture. All I can say is – wow. This is a cake with a great texture. It has the super lightness of a sponge cake but it is tender and moist like a butter cake, airy yet substantial all at the same time. The flavor is subtle and soft yet rich and delicious. It just melts in your mouth. The next time you are in the mood for a supremely delicate and delicious cake, I highly recommend this beauty. - The recipe calls for baking the cake at 375 degrees for 30 to 40 minutes. I baked the cake at 350 degrees for about 32 minutes. - Despite its name, I don’t consider this cake to be lemony. But no matter. It’s got terrific flavor as is. - Semolina can be found in bulk grocery stores. 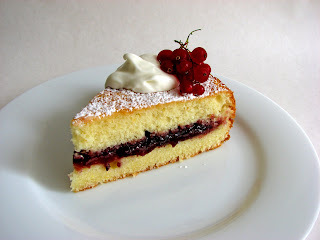 - Fill this cake with your favorite jam. I used mixed berry-currant homemade preserves. Or simply serve with a fresh fruit compote in the spring or summertime. I can definitely see this cake with fresh apricots or peaches and a nice floral Muscat, Sauternes or champagne. Or a lemon curd lightened with whipped cream and strawberries. 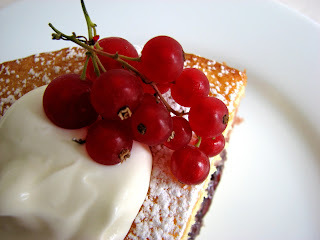 - I served this with sweetened crème fraîche, but it really doesn't need any adornment. - The cake can be kept at room temperature for up to 2 days. For the pastry cream, bring the half-and-half to a simmer. Whisk together the yolks, sugar, flour, cornstarch and salt in a bowl. Add the simmering half-and-half and whisk together to fully combine. Return to the saucepan and cook over low heat, whisking constantly, until thickened, about 2-3 minutes. Take off the heat and whisk in the butter and vanilla. Scrape the pastry cream into a bowl and let cool to room temperature, about 10 minutes or so. Preheat the oven to 350 degrees. Butter an 8” x 2” cake pan and dust lightly with flour. Sift together the cake flour, semolina, baking powder and salt. In a medium bowl, whisk together the pastry cream with the 3 ounces of butter until smooth. Add the lemon zest, lemon juice and 1/4 cup plus 2 tablespoons sugar. Once blended, add the flour mixture and stir gently until smooth. Beat the egg whites at medium speed until soft peaks form. Slowly add 1/2 cup of sugar at medium high speed and beat until the whites are stiff and glossy. Stir one-fourth of the beaten whites into the batter, then gently fold in the rest of the meringue in three batches with a rubber spatula until no streaks of white remain. Pour the batter into the prepared pan and bake for about 30 minutes, until the cake is golden and a toothpick inserted in the center comes out with a few moist crumbs. Let cool in the pan for about 10 minutes, then run a thin knife around the edge of the cake and invert. Cool completely on a rack. Use a serrated knife to split the cake in half. 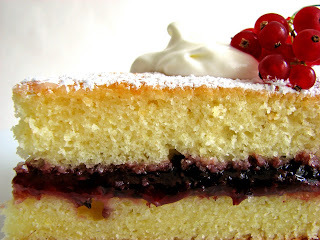 Spread the fruit preserves on the bottom layer and replace the top. Dust with confectioner's sugar. That looks delicious! My kind of cake for sure. I've had this in my massive collection of "interesting looking recipes to try" With the rave reviews I'll have to try it for sure. I'm always intrigued and inspired by new and interesting formulas. 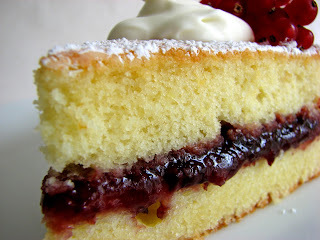 i am making some strawberry jam today so i should make cake like this to fill it with. reminds me of an afternoon tea treat. yes, please! This cake sounds nice and simple and good! What a lovely cake. I think I will try the recipe. Thanks. Light? Airy? Lemony? You're speaking my language. Sounds fantastic! I would like to bake this cake, but I am afraid I do not understand what half and half is. Anonymous, half-and-half is a dairy product you can find on the grocer's shelf next to the milk and heavy cream. You can also make your own half-and-half by mixing 1/3 cup of milk and 1/3 cup of heavy cream (or whipping cream). I made this cake last night!! So good! I made a raspberry and fig jam. Thank you! Kaylie Rose, that sounds really wonderful! I absolutely love the combination of figs and raspberries.